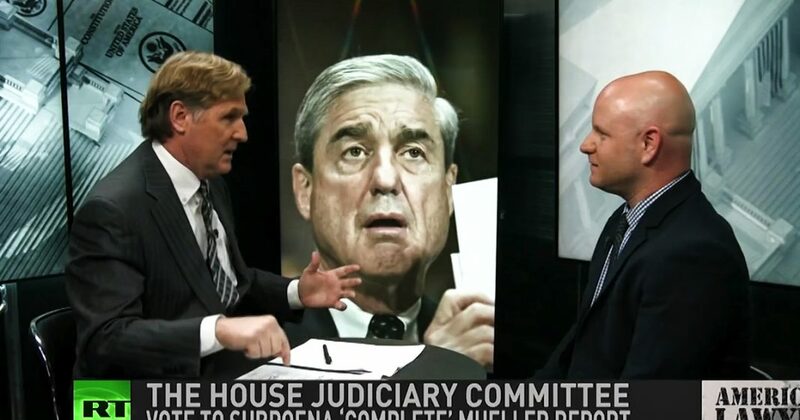 Via America’s Lawyer: Mike Papantonio and Farron Cousins tell you everything you need to know about the latest meltdown over the collusion conspiracy between President Trump and the Russian Government. Mike Papantonio: When Attorney General William Barr released a summary to Congress saying that special prosecutor Robert Mueller found no evidence of collusion between Donald Trump and any member of the Russian government, the people who had been pushing this narrative for the last two years and a half, well, they went berserk. But instead of moving on and focusing on governing, they’ve doubled down on their claims of conspiracy. Making them look, it’s really a look of desperation. I don’t know how else to, to say it. I’m joined by Farron cousins, editor of the national Trial Lawyer Magazine. You know, as I watched this meltdown, it’s becoming more and more ridiculous looking. I think of this little, what they call him, he got the name pencil neck. I don’t know who it, was it Trump gave him that? And it sounds like something Trump would say is he’s, it’s Trump’s odious enough to say something like that. But, but, but this little character now does not understand how much he’s hurting the Democratic Party. That’s the problem here. He’s killing the Democratic Party, little by little, thousand cuts. What’s your take? Farron Cousins: Adam Schiff, he really did. This is the only reason people know his name is because he has been pushing this for two years saying we’re going to get him on collusion, we’re going to get him on conspiracy for treason, for all of this. Trust me, Adam Schiff, and I am going to be the one to lead this crusade. And now you know, granted we haven’t seen the full report, but if William Barr was wrong in his summary/not summary as he’s calling it now that collusion did happen, Mueller would have come out and said that. He would have corrected it and said, I didn’t say it, but Schiff has said he refuses to accept it. He will not take that. He knows it happened and he’s going to prove it somehow. Mike Papantonio: We have to believe that Mueller now is the fraud. That, I mean, in order to believe little pencil neck here, we have to believe that Mueller is the fraud. Here, as I watched this, as I watched this grow, I think of, you know, it’s, it’s so conspiratorial. It’s almost like the Apollo, the landing never took place on the moon. It’s almost like the 9/11 truthful, you know, the truthers or, or, you know, the, the grassy knoll was a real deal. And as I watch this, this little character looks more and more ridiculous and it’s like he has no sense of self. He doesn’t have any self awareness. But I’m not, you know, I don’t care about self, I don’t care what it does to this little guy. But what it does to the Democratic Party is important. What Maxine waters does with her, every state, you’re, you’re killing a party little by little and it’s gotta be, you know, the Democrats have got to become vibrant again and this character is killing them. I don’t know how, I mean, that’s the most bothersome, bothersome thing about this story to me. Farron Cousins: Well, so if Adam Schiff and the few out there who are still claiming a conspiracy, now some of cover up with the report, if all they would do is just say, listen, we’re going to fight to get the full Mueller report released and then everybody can decide for themselves. But instead he takes it the extra step of saying, no, they’re lying. Something’s in there. And look, there’s probably a lot in the full report, but it’s going to be stuff that’s more embarrassing than it is oh, we’ve got a criminal conspiracy. Like, like with Comey when he came out after the end of the email investigation with Hillary and said she was reckless, she was careless, you know, basically calling her a fool, but said, but there’s nothing to prosecute. Mike Papantonio: Exactly. You, they’re just like, there really was nothing to prosecute with Hillary is what you’re saying. Mike Papantonio: Because there’s no intent. There’s nothing there that’s criminal. That’s what they found here in a different kind of way. Nobody ever talks about the need for intent, criminal intent. Mueller is not an idiot. If you think back the number of stories we’ve done on Mueller, we’ve always said he kind of calls it like he sees it. Mike Papantonio: Sometimes you don’t agree with him on it and a lot of things I did, you know, I’ve just totally disagreed with. I wish he had gone further, but I mean truthfully, there has to be a disclosure of the report. Now the Republicans, just like the Democrats have Schiff this freak little freak that’s bringing, taking, taking them down to the abyss. The failure of the Republicans to disclose this report is ridiculous. Of course there’s bad stuff in it. Trump does a lot of bad stuff. The people around him do a lot of bad things, but we, it’s, it’s got to come out. Mike Papantonio: And so that’s the next thing that we ought to be talking about, right? Farron Cousins: Right. Well, we had the house of Representatives just a week ago, a vote of 420 to 0 saying, let’s release the report. Let’s get it out there to the public. Our side believes it’s going to vindicate us. Your side believes it, vindicates them, whatever it is, the public agrees, get that report out there. And here’s the thing that is actually bad for Trump, is the latest poll numbers out yesterday said his poll numbers haven’t moved and it’s because the public now thinks you’re hiding something else in the report. Mike Papantonio: But there’s another part of that, those polls, and I thought they were interesting. It is that 68% of the American public says enough. Mike Papantonio: We’re tired of it. We don’t want to hear the little, you know, we don’t want to hear it anymore. And so this character, Schiff is getting ready to move in a full blown investigation rather than talking about jobs. Rather than talking about education. Rather than talking about the, the weapons industry on a, just a spending spree. Rather than talking about the budget, we’re talking about something that 68% of the public is tired of talking about and Pelosi doesn’t have enough sense to say, hey, wait a second. Let’s get this under control. It’s, it’s, you know what I got to tell you, you’ve heard me say so many times, I’m not a Democrat, I’m not a Republican, but I have a real recognition that both parties need to be strong. And right now this is killing, this is killing the Democrats and nobody has enough sense to say, say anything about it. Farron Cousins: Well, it absolutely is. And, and you, you hit it right on the head there because Schiff could have come out and said, listen, I, I’m, I’m in charge of the, the intelligence committee in the house. I understand that. We’re going to get the full report to you. Don’t worry. We’re working on that. We’ve got our staffers on it. In the meantime, let’s talk about healthcare. Let’s talk about the fact that we have people dying in this country because they can’t afford their prescription medications. We’re going to focus on legislating and passing bills and in the background we’re working on getting the report, so don’t worry. Mike Papantonio: There is only, it’s like any, anybody who writes books, anybody who produces movies will tell you that you can only throw so much negative in. Okay. Then you have to lift the story up. The Democrats don’t understand that they better lift the story up and take control of this little character Schiff and the folks that are all around him, like Maxine Waters saying, yeah, impeachment, impeach. It’s crazy talk and they need to get busy telling the American public what they stand for. If they don’t, they’re in big trouble in 2020. Farron Cousins: And I do want to add too the, the, the Democrats running for president right now, they have all actually done a pretty good job of not falling into this trap. Cause, cause honestly Trump wants them in the trap too because he’s kind of has the upper hand at the moment. But then it’s hard for these Democrats. They’re only going to be able to escape it for so long that are running for president because then you have the media and then that’s the other half of the story. Mike Papantonio: They force the narrative. Let’s talk about that. Here’s the other part of this story, it’s not just the politics behind it, it’s the media. You know, I, you know, you remember Geraldo Rivera where they were, they were cutting into the wall and we’re going to find Al Capone’s treasure. Do you remember that? The American public, they were focused on, the ratings were incredible. Everybody’s waiting for Al Capone’s treasure and they got in there and there was a bunch of nothing. And that’s what the, that’s what the media has done here. A bunch of nothing. And what, what’s what incenses me about this story, I got to tell you, I, when I think of the media, this quote, somebody, it makes the quote in the media leadership, well, it’s time to pivot now to 2020. Now when I heard that it made me so angry. In other words, let’s move on. We’ve, we’ve started a cold war with Russia. Okay. We’ve created this fantasy story out of nothing other than we’ve put these jerk legs on television who are really the fringe of conspiracy on our, MSNBC and CNN every day. We’ve, we’ve bastardized the truth and now it’s almost, I have this visual of a hyena that’s now moving from a dead carcass, a carcass in the Serengeti and saying, we’re, we’re to move on to the next carcass. That’s how angry this thing makes me. What’s your take? Farron Cousins: You and I had the same response seeing that because when it’s time to pivot to 2020 you, you spent two years and admittedly you had some people out there who would talk about it when there was a new development. You know, and say, okay, well here’s the thing that happened. We’re going to talk about this now onto the next issue. But you had other people who were all in. They were 100% all Mueller, all collusion, all the time. Mike Papantonio: CNN, MSNBC, Rachel Maddow, I swear to God, started sounding like Alex Jones. Her big eyes her, you know, her frenzy. It was crazy. And it’s still continuing as we speak. Farron Cousins: Well, because there’s a big difference between going out there and reporting on what’s actually happening. But then, and this is the problem these networks fell into, they bring on the people who assert without the evidence that nope, Trump is wholly owned by Vladimir Putin. I know it. You know it. We know it. We, that, that’s crossing the line, that that destroys the credibility and you’re, you’re speculating, not reporting on what is known. Mike Papantonio: It’s just like Schiff saying, I have the evidence. Okay, show us the evidence. Instead, MSNBC the worst, and I gotta tell you, I used to work with Rachel Maddow. You remember the days of Radio America? We, we, we work together. It’s like she’s this, this metamorphosis that’s taken place. I don’t even recognize it anymore. Sometimes I say, Rachel easy. You know, take this jerk, this jack leg off of your show. They’re obviously not credible. Quit talking about something and let’s talk about the news. I just think we’ve lost, I think we’ve lost ground there and it’s going to take MSNBC and CNN a long time. Their numbers are crashing and continue to crash because it’s a believability problem. Thank you for joining me, okay, Farron.